There’s been a lot of talk about Machine Learning and its capacity to be a game changer for businesses today but bringing this to fruition is challenging many companies. Recent studies by Indeed, Tencent and Element.AI have found that although employer demand for workers with machine learning skills is skyrocketing, the number of people capable of filling those roles is plateauing. One possible reason might be a lack of resources that help job seekers gain real world experience building machine learning models.To help, Google Cloud has been heavily focused on creating hands-on machine learning courses that expose job seekers to real-world datasets and experiences. End-to-end machine learning with TensorFlow on Google Cloud Platform: A fast, fully hands-on recap of the key lessons in the first specialization. Production Machine Learning Systems: Machine learning code is only a small part of a production ML system. This course provides an in-depth exploration of the various considerations and patterns that underlie the design of such systems. Image Understanding with TensorFlow on Google Cloud Platform: This course has you building increasingly sophisticated image models. Sequence Models for Time Series and Natural Language Processing: Here, you’ll build recurrent neural networks and encoder-decoder models to solve machine learning problems on time series predictions and natural language problems such as text classification, text summarization, and question-answering. Recommendation Systems with TensorFlow on Google Cloud Platform: The last course of the specialization teaches you to build sophisticated models for personalization. 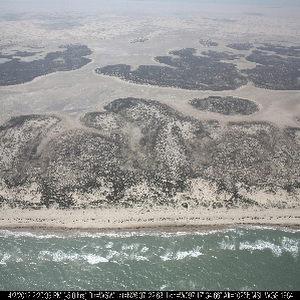 Caption: This drone image of a coastline (courtesy Texas A&M University, Corpus Christi) can be classified by a machine learning model according to its susceptibility to oil spills. What’s unique about these courses is that you’ll work with real data, on real problems using Google Cloud products throughout each course. Imagine training a machine learning model to process drone images of coastlines to identify and classify beaches by their susceptibility to environmental damage. In listening to the feedback from our first specialization, we also discovered a strong desire to write code. That’s why in this specialization the labs include specific coding tasks, and the solutions are present in the same GitHub repository to be consulted, if necessary. Join us for a webinar on October 9th at 9AM PST to learn more about the courses in the Advanced Machine Learning with TensorFlow Specialization. After that, continue your ML journey by enjoying one month free access to this specialization on Coursera. With on-demand learning, you can finish the courses at a time and place that works best for you, without missing out on any of the presentations, self-paced labs, and videos that make this specialization so valuable. *Discount applied at checkout and is available for one-time use only. Offer valid for both new and existing Coursera users until 12/31/18, while supplies last.